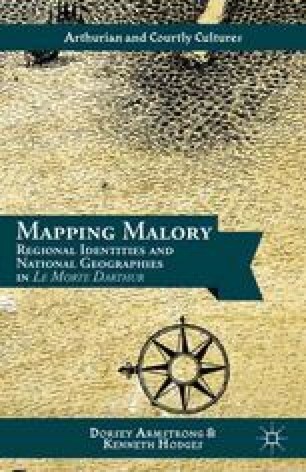 As the preceding chapters have made clear, the Morte Darthur repeatedly deploys an “(il)logics of space” in its treatment of geographic locales and the distances between them. The trajectory of quests can often telescope—in either direction—depending upon the needs of the text and the adventure at hand. Additionally, geographical features can serve multiple and seemingly contradictory purposes—for example, rivers and other bodies of water are often barriers that prevent knights from moving forward, but they can also be extraordinarily quick and easy conveyors of people from one place to another.